Saturday night Lex and I went to the fights(boxing) with her boyfriend Ethan. It was an outstanding fight card, every match was full out. Lots of the technique was beautiful, there was very little clinching and most of the fighters were in great shape. And then there was the Quincy Palmer/ Anthony Jones fight. They were two great big guys. 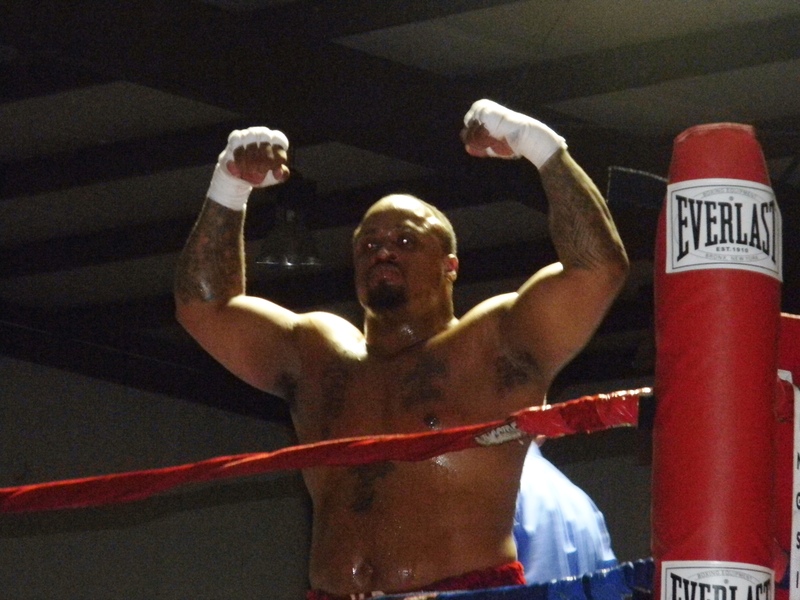 Anthony Jones obviously won the first round but both the big men were breathing hard when the bell rang. The tables turned in Round 2. Palmer was all over Anthony Jones until he was knocked out. Then we all cheered and screamed and clapped. Jones tried to get up, he crawled to one knee then went back down. 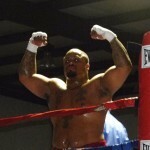 Palmer jumped on the ropes and flexed up, he pounded on his chest as the the fight doctor worked on Anthony Jones. And I took pictures of both the fighters, Jones surrounded by medics and Palmer screaming and pointing at the crowed. For at least ten minutes Jones stayed down, then they put a neck collar on him and tried to move him to a back board. His legs flailed and jerked when they moved him and I was unnerved becasue it was exactly the same way Apollo Creed jerked and spazed after Ivan Drago knocked him out in Rocky III. Anthony Jones died a few hours latter in the hospital and I’m still not sure what to think. Lex and I cheered and clapped as a man was beaten to death. It was an awesome fight. And I’ve got lots of pictures of the dead man being beaten to death. I’ve got close pictures of the doctor staring into his eyes, I’ve got pictures of Quincy Palmer on the ropes while Anthony Jones is dying in the ring. And we cheered and clapped because we went to the “Benton Beatdown” to watch some good fights. The thing that confuses me so…why do I love watching fights, MMA or Boxing? Why do I find that so enjoyable and interesting? But man has always loved watching violent conflicts, gladiators, sword fights, gun fights boxing…it’s all the same. We all loved it. But we are the only animals that organize violent events just so we can watch. It’s not our opposable thumb, music or memory that sets us apart from other creature, it’s our love of violence. We cheered and clapped as we watched Anthony Jones being beaten to death. It was a great fight.